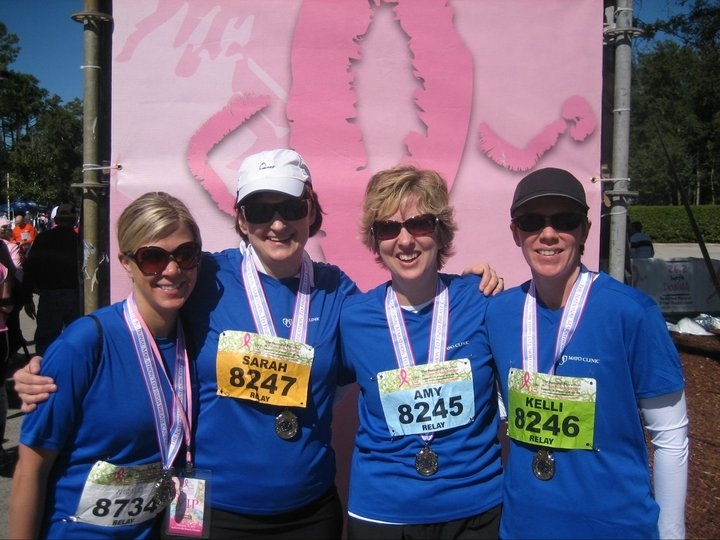 For the past four years, I’ve heard the buzz about the 26.2 with Donna: The National Marathon to Finish Breast Cancer. While I always felt it was a wonderful cause — with proceeds benefiting Mayo Clinic for breast cancer research — it wasn’t until I recently participated in the event that I came to realize just how truly special this event is for both cancer survivors and non-survivors alike. While I haven’t been personally impacted by breast cancer, it’s a cause that has been close to my heart. And about a year ago, my uncle’s girlfriend, Mary, was diagnosed, so breast cancer hit closer to home. So I — along with friends and colleagues from Rochester and Duluth Minn., formed a relay team and excitedly headed to Jacksonville to share in this unique event. When I arrived at Jacksonville’s airport, I was greeted with a large “Welcome 26.2 with Donna participants” sign. En route to my hotel, I spotted pink banners hanging from light poles. And when I checked in, the hotel lobby was a sea of pink shirts — clearly others sporting marathon spirit. Over the course of the day, I continued to see marathon signs and overheard excited conversations of others looking forward to the “big day.” My teammates — Sarah Christensen, Kelli-Fee Schroeder, and Amy Stoller Stearns — and I were energized! The morning of the race, we awoke before the sun, anxious for our race debut. We were surprised that we could hear the buzz before we got to the lobby of other excited participants waiting for transportation. The excitement was electric. Once we arrived at Mayo Clinic, where the race began and ended, we were speechless as we looked around at the nearly 10,000 other participants from all walks of life and wearing every imaginable shade of pink. Some even wore full-on costumes with pink wigs, fun socks and very “creative” team names on their shirts. As I prepared to take my place for my relay leg (I was second for our team), I was amazed at the masses of spectators, the community support by way of houses sporting banners, signs and balloons. People were cheering everywhere. I began to get more emotional, with tears in my eyes, as I watched the first leg relay runners sprint to their teammates to hand off the baton. The crowd cheered them on. I spotted Sarah sprinting by me, eagerly looking for me to pass the baton. I jumped out to meet her and hugged her for finishing strong. We exchanged encouraging words, she passed me the baton and away I went! As I started my portion of the race, perhaps I should mention that I’m not a runner. Other than four mini training sessions, I don’t think I’ve ran since “the mile” in high school. I was out of shape but I was determined to finish my five mile leg without walking. Once I passed the next crowd of supporters, I had confidence this would be easier than I anticipated. Before long, I was at the beach. As I stepped onto the sand, I looked up and saw a sea of pink shirts, supporters holding signs and volunteers passing out beverages. They spurred me on. After about a mile, I arrived at the beautiful Neptune beach community. Again, houses were decorated in support of the event and outside stood homeowners cheering with cowbells and pom poms, handing out fruit and beverages. Someone yelled out, “Thanks for running, Nicole!” That simple sentence — encouragement from a stranger — meant so much. It’s what kept me running. I was running for them, for their mother, their sister or cousin. I didn’t know who, but I was doing this for them. As I ran along, I got a glimpse of event organizers Donna Deegan, a Mayo Clinic breast cancer patient, and Dr. Edith Perez, one of Mayo’s renowned oncologists. Without them I wouldn’t have been there. They, too, kept me going. Soon I spotted my finish line and Amy. I began sprinting to pass the baton to her. We hugged and passed encouraging words of advice and she was off! I stood there — now winded from sprinting — and thought to myself, “You did it!” Another stranger in pink, a volunteer, congratulated me and hung a ribbon around my neck. As I walked away, I lost track of the “congratulations” I received from the crowd. I felt like I had just done something more important than run five miles. Fast forward to the finish line. As I arrived back onto Mayo’s campus some of the elite marathoners and half marathon runners were beginning to cross. Seeing the determination on their faces — from marathon veterans to novice runners — was very overwhelming. Many crossed with tears of joy streaming down their faces. Before long, I was sharing tears of joy with them, among thousands of supporters excitedly cheering them on. Most of us didn’t know one another. But we had one important thing in common — we were united by a cause to finish breast cancer. As I headed back to the hotel with my team, I reflected upon my first marathon experience and was once again overcome with emotions. I was physically exhausted from running five miles without training, but more than anything, I was exhausted from the myriad emotions that seemed to be simultaneously surging through me — happiness, excitement, anxiety, and a sense of pride of being a part of such an amazing event. I was — and still am — in awe that nearly 10,000 participants united like a family for such an important cause. Breast cancer is an important cause. 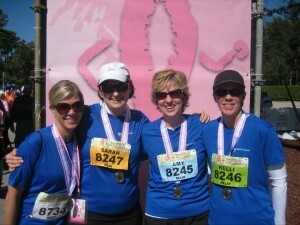 But for me, it will forever have an even more special meaning thanks to my experience with the 26.2 with Donna. I’ve already registered for the 2012 event. Please consider joining me! No comment at the moment as at the moment i am scared out of my wits after self diagnosing Pagets Breast disease.